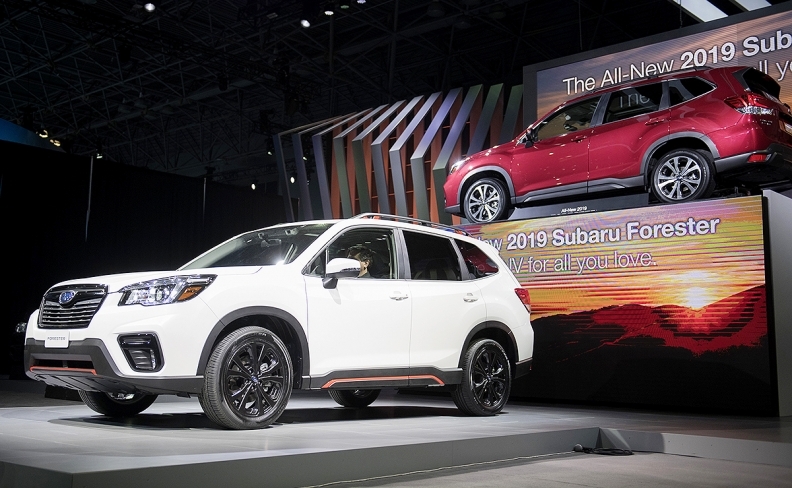 The Subaru Forester compact crossover is unveiled during the 2018 New York International Auto Show on March 28, 2018. The redesigned Subaru Forester compact crossover comes with a slight price increase to go along with its bigger size and safety technology now standard on most — but not all — trim levels. The 2019 Forester will start at $29,720 (pricing throughout includes shipping). The automaker didn’t immediately say how much shipping will cost. Subaru says the redesigned Forester, which moves to the brand's global platform, is more spacious than before, with the wheelbase stretching to 267 cm (105.1 inches) from 263.9 cm (103.9 inches) on the outgoing model. Rear-seat legroom grew by 3.6 cm (1.4 inches) with the redesign. Available only with a continuously variable transmission and one engine choice -- a freshened 2.5-litre four-cylinder boxer engine that produces 182 hp and 176 pound-feet of torque -- the 2019 Forester's starting price is $700 more than the 2018 base model with a CVT. The previously offered manual transmission, as well as the XT trim and its turbocharged engine, did not survive the redesign. Subaru's EyeSight driver-assist technology, which includes automatic pre-collision braking, adaptive cruise control, lane-departure and sway warning, and lane-keep assist, is standard on five of the six trim levels. It’s not available on the entry-level 2.5i base model but is an option on the Convenience trim level. EyeSight driver-assist technology is standard across all trim levels in the United States. Subaru Canada Senior Director of Product Management Anton Pawczuk explained why EyeSight isn’t available across the board in Canada. Above the base 2.5i trim is the Convenience version, which starts at $32,020 — EyeSight costs an addition $2,300. The the Touring trim, starting at $34,720, includes EyeSight as standard equipment. It also includes a proximity key with push-button start and reverse automatic braking, as well as high beam assist. A power rear tailgate with memory function and a large power-slide glass sunroof are also included. The 2.5i, Convenience and Touring trims all come with a 6.5-inch touchscreen, Apple CarPlay and Android Auto as standard. The Sport trim, new for 2019, is highlighted by black and orange accents throughout the exterior and 18-inch wheels. It starts at $36,720. The Limited trim adds 18-inch alloy wheels and a premium front grille. The eight-inch infotainment system includes integrated navigation. Leather upholstery in either black or platinum is also standard, as are a heated steering wheel and heated rear seats. The Limited starts at $39,420. At the top of the Forester lineup is the Premium trim, which starts at $41,220. Subaru has called the Touring trim the "most luxurious Forester ever." Inside, customers get a choice of a black or brown interior and options that include a 10-way power driver's seat, an eight-way power front passenger seat, heated rear seats and an eight-inch touchscreen. DriverFocus, a new monitoring system that uses facial recognition software to identify signs of driver fatigue or driver distraction, is standard on the Touring trim. The system can recognize up to five people and remember their presets for seat position, climate and infotainment. The redesigned crossover is expected to arrive at Canadian dealerships in November. Subaru has sold 7,391 Foresters in Canada through July, down 11.5 percent from the first seven months of 2017.